Damn it, now RubyURL is gone too? It was like giving Ruben URLs! 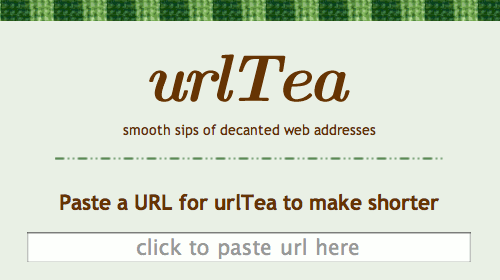 Back in 2007 when the URL shortening scene was first exploding alongside the growth of Twitter, I chose urlTea and RubyURL because the former was adorable, and the latter was written in Ruby and sounded like my name. Giving people a RubyURL was just too cool an opportunity to pass up. I suppose they didn't reference what time scale they were referring to when they said "shortly", although to their credit it is a terribly delicious pun. Their Twitter account (@rubyurl) has also remained silent for over a year now. Its another stark reminder that URL shortening services are a terrible, terrible idea: RubyURL has been having enough issues of late that I now count it alongside urlTea and parrots as no longer existing. For those who don't rememeber, urlTea disappeared in 2009 (Is it a final goodbye for urlTea?) and to this day displays a DreamHost page. Archive.org's offer to backup URL shorting service databases is a nice idea (301 Works), but nobody has really been doing much with it and it doesn't escape the fact we're increasingly relying on these single points of failure. If anything, they should simply serve to highlight the fact URLs in their current form are no longer serving our needs. I wrote about this in 2009 (urlTea now tr.im, this stuff is scary). What was I saying? Oh yeah, obfuscation is being increasingly used to mask the locations of dodgy sites, to such an extent that a slew of sites are no longer allowing the poster child service TinyURL on pages hosted with them (Wikipedia: Sites blocking URL shorteners). I think rejecting certain sites based on what they could be used for sounds an awful lot like the MPAA claiming VCRs and BitTorrent are evil, but url shortening services could certainly do more to help make their shortened links more transparent. Ironically, out of all the services out there, TinyURL is one of the few that lets you preview URLs before proceeding! Anyway goodbye RubyURL. Glad I only ever used for some inane tweets, and nothing important. It's a shame, they were such a killer startup! Wow, this post has so many links, none of which were shortened :).